It's the sheer size of the structure that first strikes you. 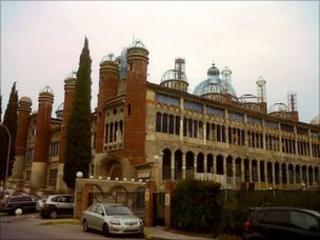 Almost 40 metres (131ft) tall, its spires and giant dome tower over the surrounding apartment blocks in this Madrid suburb. That's not unusual for a Spanish church. But this one is being built by an elderly man, almost single-handedly, out of junk. Justo Gallego - or Don Justo, as he's known - embarked on his epic endeavour almost half a century ago. Now 85 years old, he still has a huge amount to do. Christmas was a rare rest day for Justo, whose one concession to age - and the weather - is to work inside during winter. Even so, he's on site by 6am each day, sporting his red woollen skullcap. His grubby overalls are tied loosely with one red scarf; an identical one is draped - almost elegantly - around his neck. "I do it for faith. That's clear, no?" the energetic octogenarian wonders, pausing to warm himself by an open fire. "My mother was very pious. She taught me my faith and I love the Church. So I put everything into this." But as a printed statement on the wall declares, Justo Gallego is "not an architect or a bricklayer" and has "no training related to construction". Even his basic education was interrupted by the Civil War (1936-39). "You don't need to study. You just need strength. It all comes from above," he reasons. So is Justo's giant construction a remarkable act of faith or pure folly? His church has no planning permission or formal architectural plans. All the details, Justo says, are "in my head". Partly modelled on St Peter's in the Vatican, Justo claims his construction also borrows from the White House, various castles and other Madrid churches. It's an eclectic mix. The vast central dome took 20 years to erect and there are two dozen more incomplete cupolas around the building. There are cloisters, a sacristy, even a cavernous crypt. Sections of several walls have been painted gaudily to depict scenes from the Bible. But, with no funding, the entire place is built out of recycled materials. At 0400 every morning, Justo collects reject bricks and broken tiles from nearby factories and yards and deploys them in his church to higgledy-piggledy effect. The columns supporting the ceiling were moulded using empty oil drums. The covering for one cupola is made from plastic food tubs, cut up. "People have called me crazy and insulted me. But they're ignorant," Justo says defiantly, during a guided tour of his life's work. "When I look at what I've created, it overwhelms me and I give thanks to the Lord." A former novice monk, Justo began work on his DIY church when he was expelled from the monastery after contracting tuberculosis. He has since invested his entire inheritance in the project. He has one faithful helper who dropped by almost 20 years ago to visit. "I thought the place was a ruin and Don Justo was a tramp," Angel Lopez Sanchez recalls, as he marks patterns onto glass with gold paint. His two ferrets sleep in a cage in the corner. The bricks don't meet minimum standards, either in themselves or the way they've been laid. "But we spent all day chatting, he fed me chorizo and as I had a lot of spare time, I told him I'd help. He got so deep into my heart that I'm still here today and very content." Angel estimates the window he's decorating is about the hundredth. There are around a thousand more to complete. "But this is all Justo's work, and his ideas" Angel smiles. "I'm just his disciple." "I work in a hurry, always in a rush," Justo says, as he smashes panes of coloured glass into tiny fragments for Angel to glue to the windows. "Realising my ideal spurs me on. People today are very passive, they don't value anything. They're slaves to worldly things." But Justo is well aware his extraordinary ideal may never be fully realised. As well as finishing the windows, the central dome still has no cover and the floor is bare; spiral staircases curl up towards the heavens and end in mid-air. Scrawled on the wall in chalk are urgent appeals to visitors to donate funds for the church's completion. So far, the town council has tolerated the illicit structure, which lures a steady trickle of visitors to the nondescript suburb. Some suspect the chaotically-constructed church will not outlast its creator. "It's very difficult to get a license now," says Pablo Queralto, an architect working for Mejorada council. "For example the bricks don't meet minimum standards, either in themselves or the way they've been laid." But he described the eccentric edifice as an icon of the town now, unlikely to be torn down. Justo has bequeathed his building to the local bishopric in the hope it can eventually serve as a fully functional parish church. That's his ideal, though he's pragmatic. "Who knows what he'll do. It's up to him," he shrugs. But as Don Justo rushes back to yet another urgent task, he says he has no regrets. "If I lived my life again, I'd build this church again, only bigger. Twice the size," he smiles, his elderly eyes sparkling. "Because for me, this is an act of faith."